Relief printing using etching press is very doable. I don’t own a massive old iron printing press that I covetously see in some studios and campuses, like the famous Albion Press for example or better still – a Vandercook proofing press. Although it would be great to add one of these to my studio, for now I use my etching press very successfully for relief printing. The principal of this press is that it’s like a wringer washer where the matrix and paper is squeezed through the tightened rollers (instead of wet laundry). 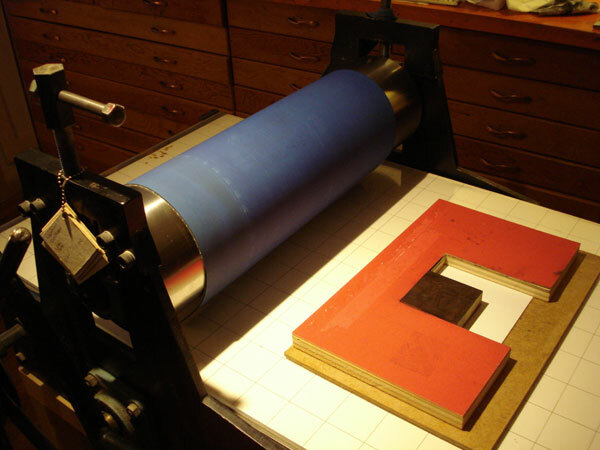 With the added protection of felt blankets the pinching action of the steel rollers forces the paper to pick up the inked portions of the plate. My setup involves a carrier arrangement made out of plywood and Masonite fixed to the bed of the press with a bit of double sided tape. This helps absorb the immense pressure of the steel rollers minimizing damage to the press or the block. 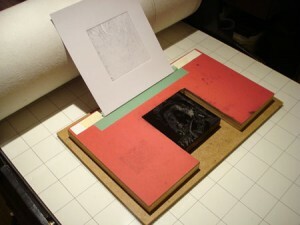 After inking up the woodcut – in this case a boxwood wood engraving – I place it in the opening within the carrier as shown on the left. 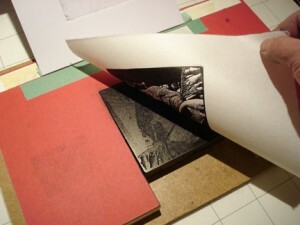 Then the paper is laid down on to the inked surface and the cardboard tympan is lowered followed by the felt blankets. The whole affair is passed through the rollers which have been adjusted to the correct pressure. Another option that seems to trump the use of cardboard tympan is a sheet of lithographer’s rubber blanket. These compressed rubber sheets are used in the commercial printing industry on offset presses and are discarded with regularity. The cast-offs are very useful for us relief printmakers using an etching press. Here’s a close-up of one of these used reconditioned sheets. It’s made up of four ply material with fabric backing. This set-up shows the absence of regular blankets altogether in favour of the rubber litho blanket. 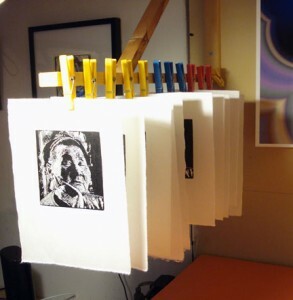 This method produces very fine prints because of the consistency and density of the rubber blanket. It has just enough give to take up any irregularities in the block. After adjusting the rollers just right you’ll find that not very much pressure is needed and less ink is required too. Thanks to Maria Arango Diener for sharing the info about the rubber blanket technique. You can probably get some blankets from local commercial printer since they just throw them away. Or you can do what I did and purchase reconditioned ones for a very reasonable price from this eBay dealer, lgsstorage. That’s how I pull my editions, both wood engravings and regular relief prints although I really enjoy hand burnishing with the back of a wooden spoon but only when practical to do so. Sometimes when I get into a groove, it’s hard to stop the rhythm of rolling, inking and printing. Before you know it there’s a row of prints on the rack drying. Someone had left a comment here regarding a heavy cast iron press. Unfortunately it got nuked accidentally in my spam catching utility. If the poster reads this can you please re-do your message? Thanks. Your advice has given me heart; have had little success pulling successful woodengraving prints using my etching press I shall keep trying! I’m glad to hear that. Don’t give up. Actually the etching press distributes very even and controlled pressure as the roller passes across the block. The trick is to distribute this force across the width of the rollers so that all of it isn’t pressing on the block thereby risking damage. You can make up a removable unit like the one shown to accommodate different sizes. Once it is set up you can print an edition in relief quite efficiently. Some nice etching press pictures. Thanks for showing your steps on how to do that! This is very helpful information, and the rest of your blog is delightful. I looked at the rubber blankets on ebay and am going to buy one. Before I do, I want to make sure you use 4-ply since I see they have others available. 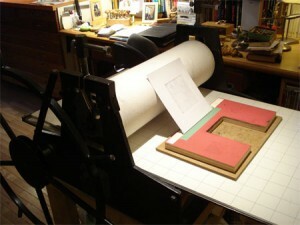 I am printing on a smaller etching press than the one that you have and I am going to try this setup on my press. 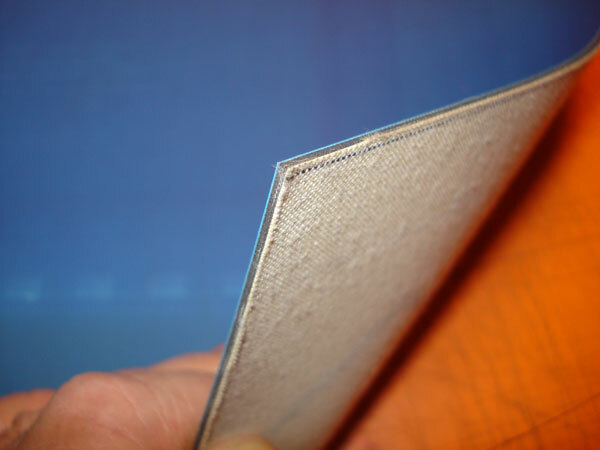 Are you still using a tympan with the rubber litho blanket, and if so, how thick is the tympan? Also, could you say something about how you start your initial pressure adjustments when setting up to print? Do you just crank the top roller down hand tight with everything ready to print and go trial and error from that point? No, I am just using the rubber litho blanket although I still am experimenting with a tympan which is simply a piece of matboard. I find the pressure adjustments certainly vary between the use of the rubber blanket and the cardboard. The rubber being more sensitive and not requiring as much pressure. As far as setting the initial pressure goes is a bit tricky because one certainly doesn’t want to damage the printing block. I’ll set everything up and then lower the roller so it rests on the carrier blocks then I’ll give it a few turns for a bit of pressure and advance the press bed. If I’m feeling too resistance when it reaches the block I’ll back off a bit and run it through. From that point you can better judge the balance between inking and pressure. Hope this helps. I just ran a couple of prints using your approach and they printed beautifully. These are woodcuts on birch ply and a few of the delicate lines filled in after the first print so I’ll have to experiment with the pressure and the inking to see if I can regain those lines before I pull the edition. These are the first prints off of this press and only the second or third time I have printed woodcuts on a press and the results are quite good all things considered. Thanks again for taking the time to share your ideas and procedures. And by the way, you’ve some really nice work on here in your gallery. Glad to hear you are getting promising results. I find the toughest to find a balance between inking and press pressure. I just purchased an old Chandler & Price platen press, so we’ll see how that goes. Glad to hear about your purchase. Good luck with it and maybe we’ll see some of the results of your efforts with that press in the future! Thankyou so much for this article. It has been very useful and I have come up with great results. Hi. You have answered so many questions for me in this post. I am a textile artist with an interest in digital and traditional printmaking techniques. I want to buy a small press initially to print laser etched wood blocks onto unusual surfaces. I had considered a platen type press but may want to develop intaglio techniques at some point. Your comments have reassured me that an etching press would be OK for relief style work. Having used a wonderful old Columbian press with great results in a university print department that of course would be first choice for relief printing but sadly limited funds and space really makes that a non starter! Thanks for taking the time to read my post. Yes a Columbian press would be just the thing but as you say the cost is prohibitive for most of us “starving artists”. However, a good etching press can do the job as long as there are carrier blocks to help distribute the pressure. And of course you have the versatility of doing intaglio work. Thanks so much for the information. I was wondering what ply rubber blanket you are using? I should add that I also use the wool etching blankets on top to help distribute the pressure. Hi John, Thanks so much for this post! I have a Conrad press which I love, but I have lots to learn about printmaking. After reading your post I purchased a rubber blanket from LGS; tried it out today with excellent results. Now to improve my carrier system! I hope some tweaking will help with the occasional paper slipping problem. Thanks again for sharing your process! Thanks Elizabeth, Yes the slippage of the rubber mat while being pinched between the rollers can be an issue. I ended up simply hinging a section of the rubber on the carrier to make sure it stays in place. Mind you this works well for my smaller wood engravings. A larger matrix might be different. Just the same I’ve had good results with those discarded litho blankets. That’s an excellent idea, I’ll try that! I really like the even pressure I get with that rubber blanket, better than the felt ones by themselves. And I think roller pressure and my not-so-great carrier are contributing to the paper issue. All signs point to operator error… I didn’t name my press ‘Patience’ for nothing! I actually use the felt blankets as well, somehow it seems to give a better result. Thanks for the great idea, John. I have cadged half a dozen *large* blankets from a commercial print works. Now to trim them to size and, oh yes, buy the etching press! Thanks for your comment David, hopefully you can find a reasonably priced etching press. If set up properly it will yield good prints. This information is very useful to me, as I work both in relief and intaglio. I was especially interested in the photo of your press set-up that showed the rubber blanket somehow attached around the top cylinder. Could you please elaborate on this ? The rubber blanket is only draped across the roller even though it appears as if it’s attached. I’ve modified the way I print in relief this way by including the etching blankets as well. I think they they provide some nice cushioning and hopefully distribute the pressure as well. Combined slightly dampened paper I’ve had good results printing my delicate wood engravings this way. I have been a printmaker since the mid-1960s. My heirs will not know what to do with my many etched plates and woodcut blocks, and I do not know either. Can you please advise how such artifacts can best be left, or disposed of, particularly if the image is still valid and printable, the designated edition not completed? I am finding these published question and answer emails extremely helpful. What a great resource! That’s a good question that many of us are faced with. One option you might consider is to make arrangements with a local museum or art school. Your plates and blocks could be used as a teaching aid or fund raising with the incomplete editions. At the very least I hope you can digitize all of your work along with photographs of your woodblocks, etc. Another avenue you might consider is to sell your blocks individually as works of art, which they are of course. You can prepare them in such a way that they can’t be used for printing. In this way, you’ll know that they’ll be left with people who appreciate your work. Of course you could destroy them, but that seems sad to me. I’ll give it some more thought since I have a similar issue. I’ve just bought a little press for printing my linocuts, and the rollers are made of rubber. I’m new to using a press, so I’m trying to figure out what blankets I need to get. Do you think that as my rollers are rubber I might not need blankets at all? Congratulations on your new press! Can you tell me a little more about it? I’m intrigued that your rollers are made of rubber, usually these are made of steel. Let me know and hopefully I will be able to offer you some advice. Here it is – I haven’t received it yet, so what you see here is all I know. Hi Catriona, sorry for the late reply. I looked at your press, and it looks like it will do what you want it to although it does seem rather light duty. I think you should employ some kind of blanket, perhaps even the rubber litho blankets I use, just to help distribute the pressure a little bit. Thanks. Yes, it’s here now and it’s light duty but I’m enjoying getting to know it. I’ve ordered a 3mm etching blanket and until that arrives have been using an old baby blanket (mostly to protect the rollers). I am a printmaker and have used a Conrad etching press for wood engraving, and can appreciate the problems! Your carrier sounds like an excellent idea. One question: in the picture the engraving block is slightly higher than the surrounding carrier surface, so press cylinder would not seem to contact the sides and distribute the pressure. Does the rubber blanket make the difference? This is a great post – thank you! I was wondering if you have any issues with the carrier indenting the paper as it is rolled through the press? I’ve used “runners” along each side of the press bed to distribute the pressure but they have to be wider than the paper otherwise I have two strip indentations on each side! (I was printing lino or gomuban). Thanks for your post Rene. Yes I do run into that problem from time to time although I find that using that blue rubber litho blanket as a tympan seems to help somewhat. And if the block is just proud of the bearers it may not pick up the indent. Otherwise I try to iron out the crease if it’s really bad. Where can I buy the kind of rubber blanket that you use for relief printing? I have a Glenn Alps collagraph press. The bed size is 66 x 30 inches. Pretty big press. I am refining my press technics. I make intalglio, lino cuts , watercolor monotypes on lexan & matboard relief plates. Sounds like a great press, nice size too. I think it should be okay to use one thin blanket. I’m assuming that your lexan is just a flat surface and not too thick, right? You’d use your sizing catcher or the pusher blanket?